Annie Avery of Northrop and Johnson phones to say that she'll be hosting a brokers' open house aboard Trinity's 49.07m superyacht _Destination Fox Harb'r Too _on Wednesday, October 14th from 4pm until 7:30pm at the Derecktor yard in Fort Lauderdale. Delivered in 2008, her contemporary Patrick Knowles interior accommodates 12 guests in a master, four doubles and a twin and she cruises at 16 knots. 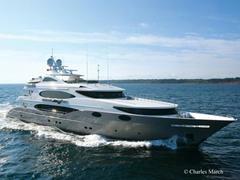 Not for sale to US residents while in US waters, she's asking $29.5 million.